I have Mondays off, and I generally like to enjoy the company of my friend Debby on those days. We find a place to hike for a bit, or visit a park, or whatever. Then we’ll do some shopping or grab some lunch and a cocktail. She’s always up for a bit of an adventure, so sometimes we end up in unexpected places. Today was an unexpected places Monday, for sure. I had picked up a local magazine yesterday because it had a cover of interest. And inside I found North Central Florida’s Dial and Discover tour. You check out a map online, drive to one of the historical places on it, dial the phone number on your cell phone, and you hear a recorded message of the history of the site. It sounded like a perfect Monday Adventure! As I was checking out the Cross Creek map, I saw one little note about popping by the Antioch Cemetery in Island Grove, as Marjorie Kinnan Rawlings is buried there. 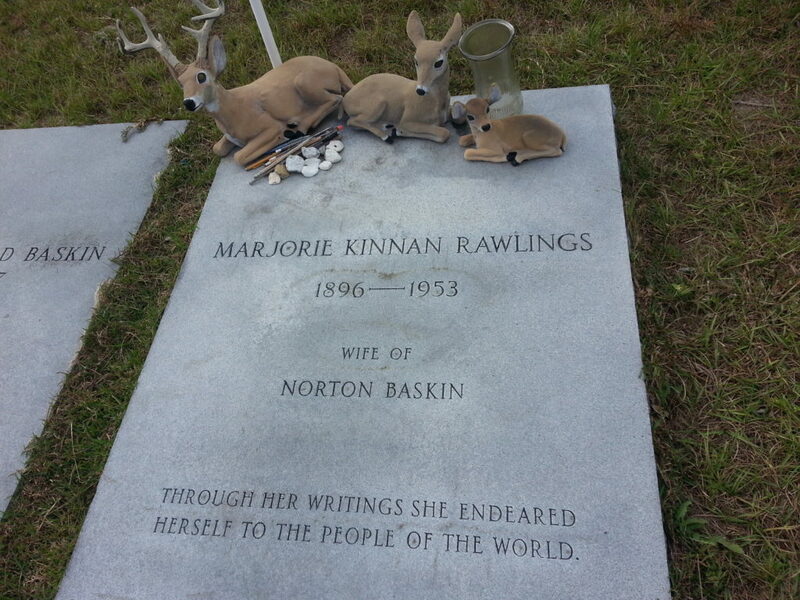 Having been to the Marjorie Kinnan Rawlings State Park a few times, I was more interested in a little adventure further out into the sticks to her burial site. So even though this attraction isn’t on the Dial and Discover tour, off we went! After, of course, stopping for lunch and beers at Blue Highway in Micanopy. 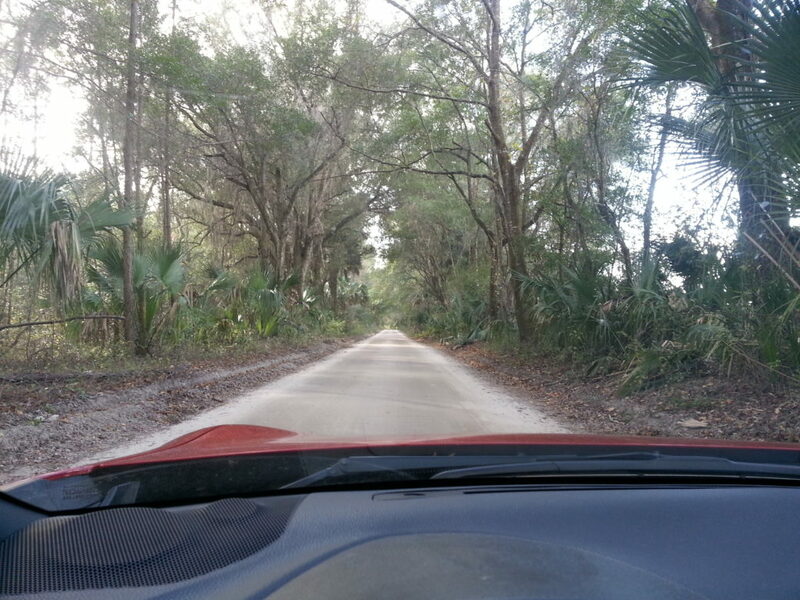 Looking over the dashboard of June, driving down a well-cared-for dirt road towards Island Grove, FL. Marjorie’s grave is at the Antioch cemetery near Island Grove, Florida. It’s a neat little graveyard with many lavishly decorated graves. There are benches and little figurines and decent sized statues all over. Plus, we found some fox poop and an entire shed snakeskin! (The wild animal trifecta was rounded out nicely later when we saw a few sandhill cranes pecking around a rural yard.) As you can see, Marjorie’s marker is simple and understated, reflecting her preferred way of life. On our way to Island Grove, Debby and I noticed two things: 1) The dirt road we were driving on for many miles was impeccably cared for, and 2) next to each sign pointing the direction to the Antioch Cemetery was a sign pointing the same direction to the Island Grove Winery. It being an adventure day, we were sure to follow *both* signs! Now, I’m not a wine drinker. At all. Though I do love a cold glass of bubbly, the sweeter and cheaper, the better. 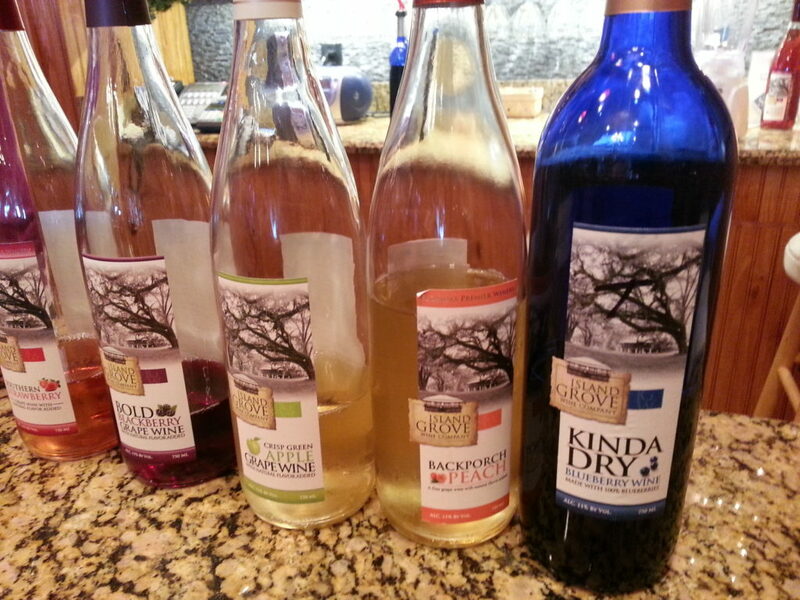 Plus, I don’t care for muscadine grapes, which are what most Florida wines are made of. So I was pleased to learn that as we drove down the Island Grove Winery driveway we were passing blueberry and blackberry bushes. We entered an adorable little gift shop and tasting room, and were greeted with a three or four swig glass of each of the eight or so wines that are available right now. The listing read like a Jolly Rancher menu: blueberry, blackberry, green apple, raspberry, peach, strawberry, cranberry. And these sweeties are right up my alley. I imagine most wineauxes would have visibly cringed when the server started speaking my language by saying, ‘Sometimes I like to mix these two together and add a little Sprite and a couple of ice cubes!’. So yeah, that one was a true Monday Adventure! Oh, and those remarkably well-kept dirt roads? The upkeep is done by the winery as at the height of the season there are many semi trucks using that road daily. Best quest ever.